Travelling to Kyoto? 7 Absolute Must Eats in Kyoto! With Options for Vegetarians too! 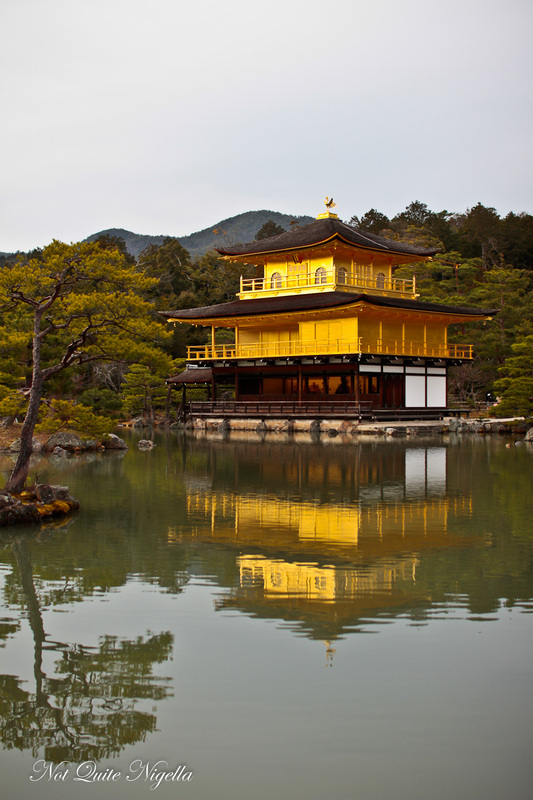 Kyoto is one of the biggest draw card destinations of Japan and a vast contrast to capital Tokyo. Formerly the imperial capital of Japan it is now a place known for cherry blossom viewing (hanami) that it is currently in the midst of and beautiful temples. But did you know that Kyoto is home to a very special cuisine of its very own? There is exquisite Kyoto style sushi, high end kaiseki cuisine, sweets, tofu restaurants and some of the best vegetarian food you could ever eat! 7 Foods To Travel To Kyoto To Eat! Kyoto in late March and the first half of April is the time to visit for Cherry Blossom season but if you want to see beautiful works inspired by nature then try Kyoto style sushi. Because Kyoto is located inland and fresh fish was harder to obtain a lot of the sushi toppings are made using cured fish as well as vegetables. 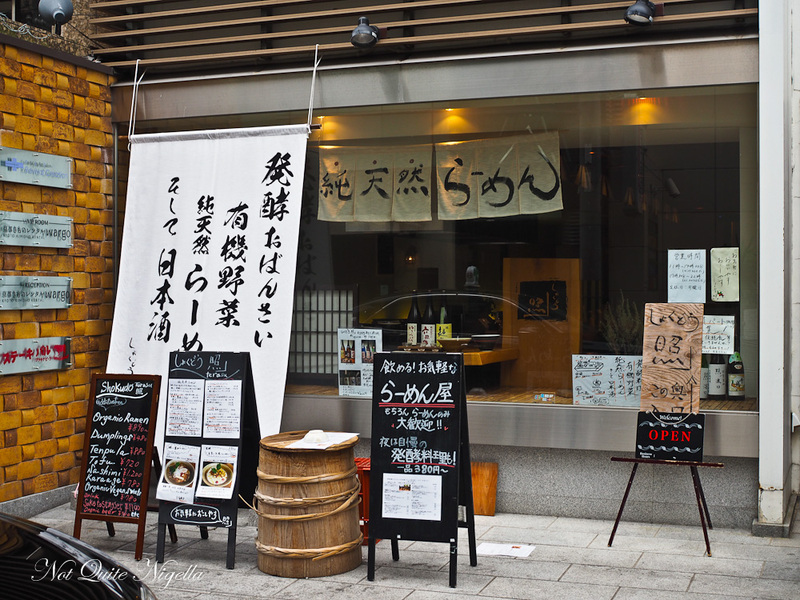 Restaurant Mametora is located at the end of Hanami-Koji in Gion. 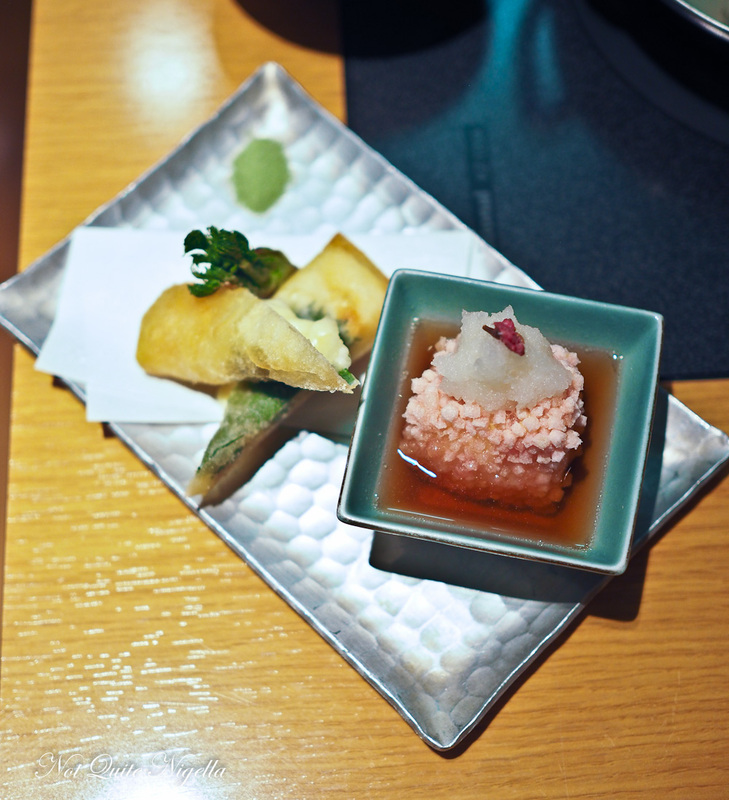 Undoubtedly the star of the menu is the Kyoto style sushi or Mamezushi (small sushi bean) or Maiko sushi. 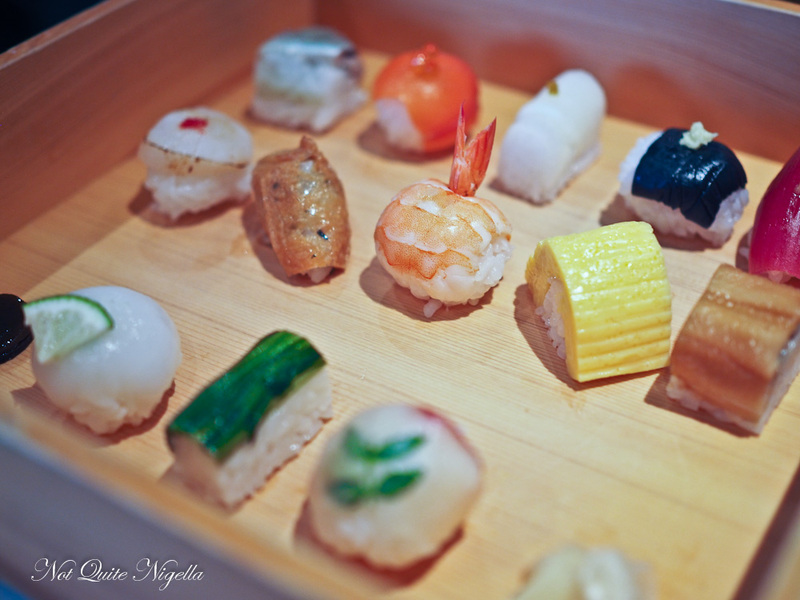 It was created for Maiko or apprentice geisha and it smaller in size than regular sushi and round in shape. This was said to be ideal for the Maiko geisho who have small, round shaped mouths (or at least their lipstick suggests so!). Each piece of sushi is petite and exquisite, some topped with aburi scallop, some semi translucent slices of golden shallot of eggplant. 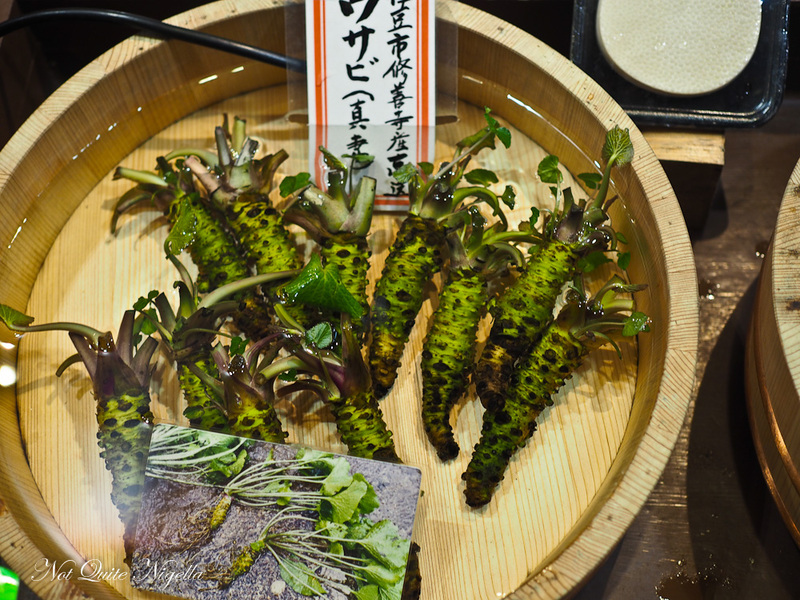 A long piece is covered with negi or spring onion while the hano or Daggertooth Pike-Conger eel sushi simply melts in the mouth. Inarizushi is smaller and triangular in shape than is often seen and completely folded over. 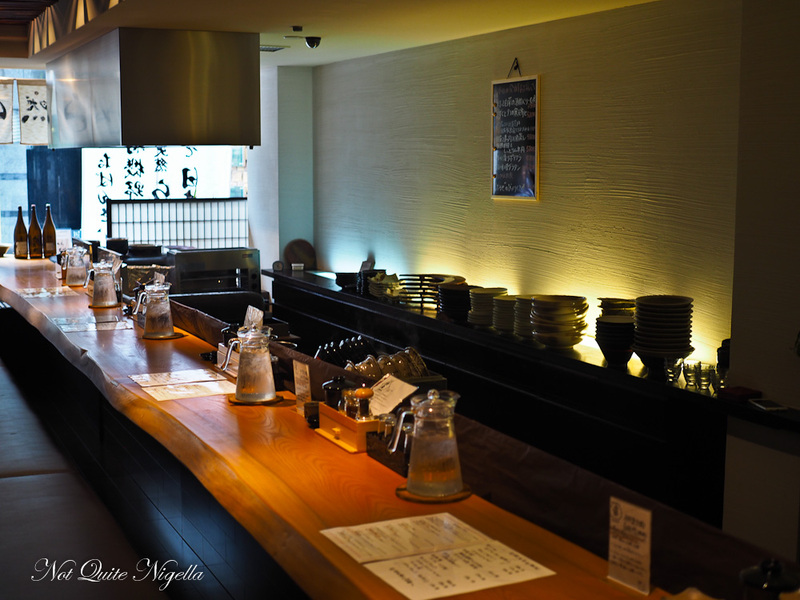 The atmosphere at Mametora is calm and refined. You take your shoes off and kimono clad wait staff serve you. The food is beautifully presented and focuses on foods in season like grilled bamboo shoots or dashi based soups with custards inside. Tip: Mametora is a 10 minute walk from GionShijo station. It opens at 11:30am and arriving between 11:30-12pm means that you may skip the queues. They serve a set course meal for lunch. At either Y4200 or Y6000 it isn't cheap but it's very pretty and popular. Okay stay with me. Tofu? Who on earth travels to eat tofu? I always think of Oprah when I hear the word tofu as she couldn't muster up any sort of enthusiasm for the stuff on her show and if you're like Oprah then this is perhaps the best chance for tofu to change your mind. Kyoto's tofu is perhaps the best known tofu in Japan and the reason being is that the water in Kyoto is soft water with low amounts of calcium and magnesium that results in a smooth textured tofu. Certainly it's entirely different from the slightly grainy tofu that you can get. But if you do like bold, full flavoured food then tofu might not be your thing. 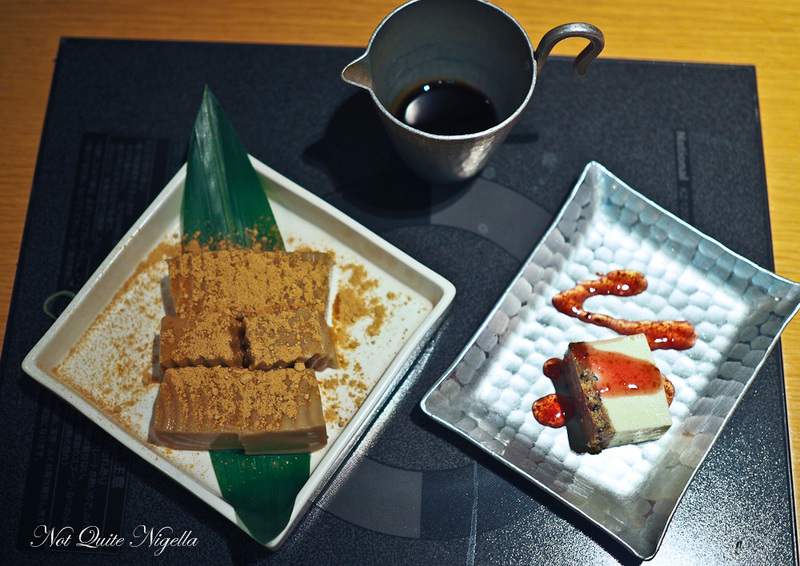 Japanese food is all about subtle delicacy and nowhere more is this demonstrated than with their love of tofu. There are plenty of tofu restaurants but given we are only in Kyoto for a short time as soon as I arrive by shinkansen and meet Mr NQN at Kyoto station, we go straight upstairs to Kyotofu Fujino. Located on the 11th floor of the Isetan department store above Kyoto station this is one of the most convenient branches to try Kyoto's famous tofu. There are some tables with gorgeous views of the city too. And despite the fact that they could fit more people in and crowd you in they don't. There are a la carte menus and three dinner set menus although they ask that two people do not share a set (although realistically there is enough in a set to feed two). The tofu is something else and even better than I expected. It comes in so many forms from a fluffy soft tofu covered with starchy amber sauce, deep-fried tofu with tiny, crispy ricecake cubes (my favourite), cooked rice seasoned with deep-fried tofu and yuba (tofu skin). Even the tofu Caesar salad is tasty (although more inspired by Caesar salad). The soy sauce makes a huge difference and infuses the beautifully textured tofu with flavour. 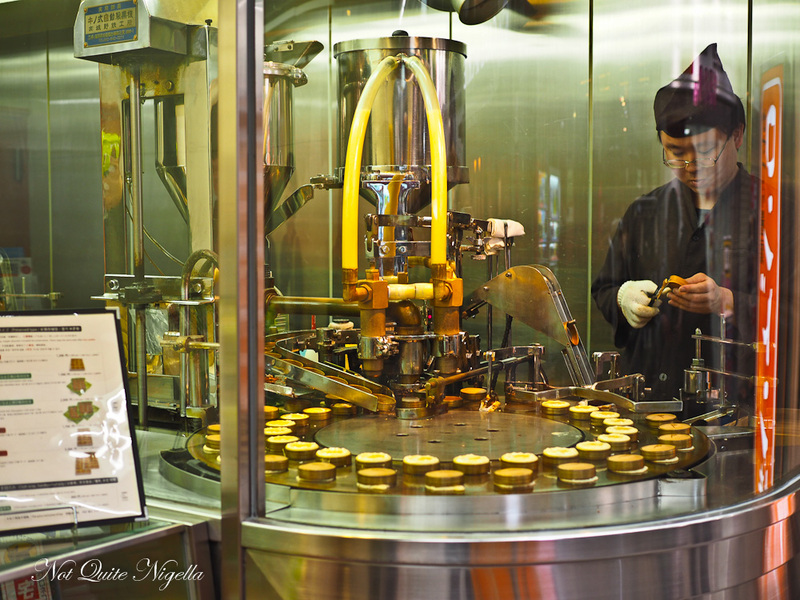 At the end they will make up a cup of matcha freshly whisked and prepared - another of Kyoto's specialties. After visiting Kyoto, my mouth waters for tofu. Tip: Be prepared to wait though as the lines are long. You take a seat at the end of the sitting queue and as people are seated you move seats closer to the door. They also do halal meals (three days' notice is required). 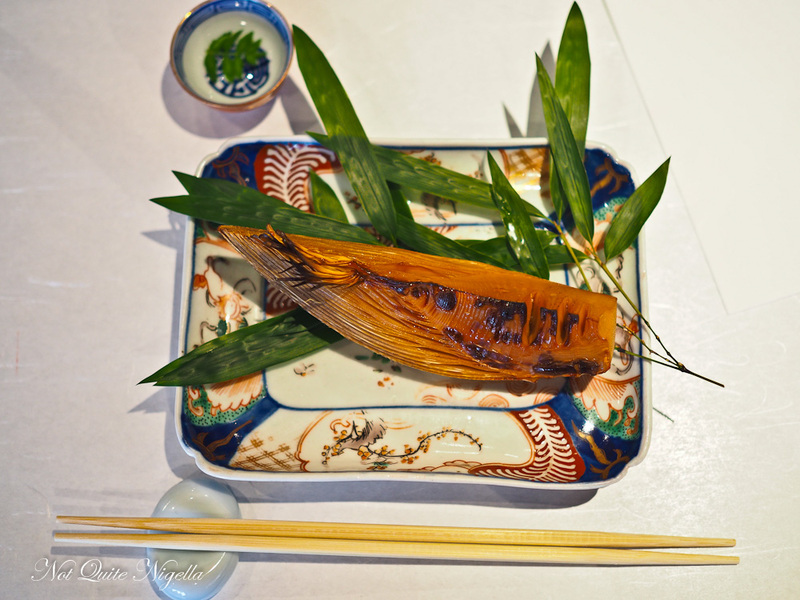 Japanese Kaiseki cuisine is haute cuisine served as multiple courses of exquisite seasonal food over a period of time. 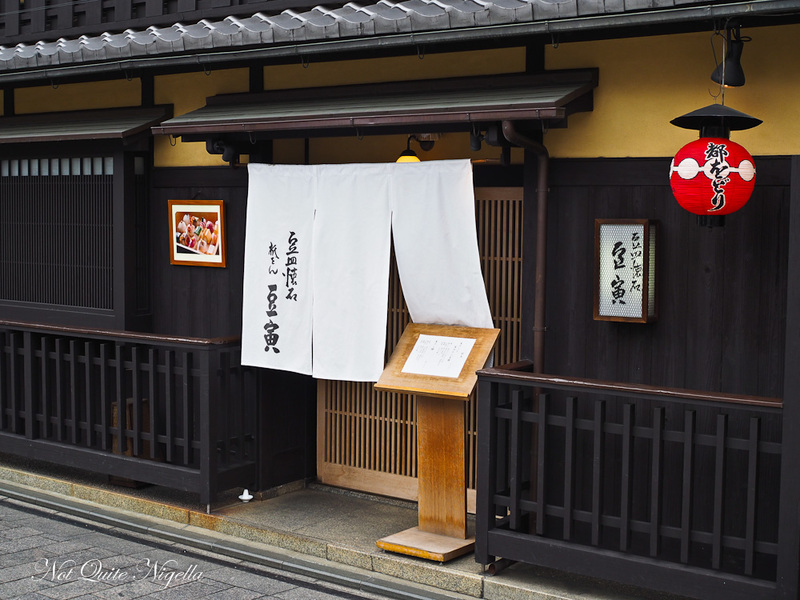 And Kyoto is known for its kaiseki cuisine because it was the home of the imperial court for over 1,000 years. 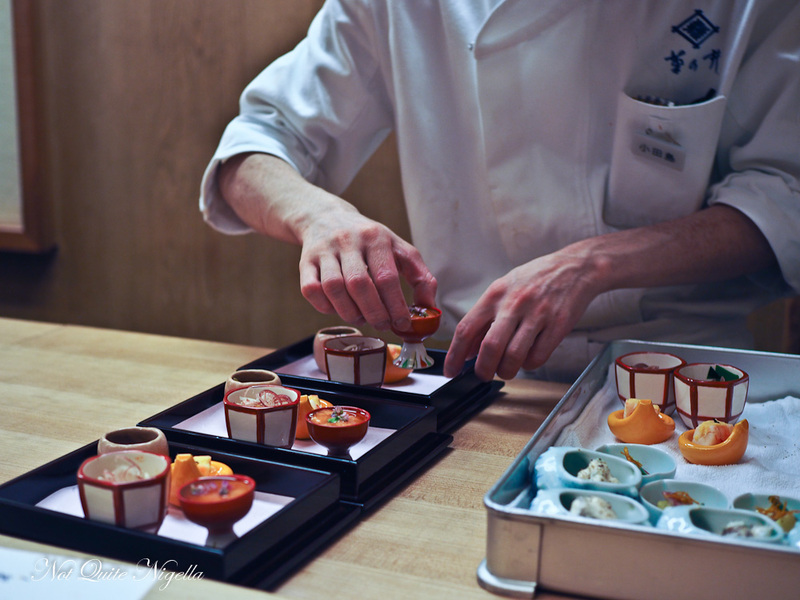 But be prepared to fork out some serious cash for the whole kaiseki experience. 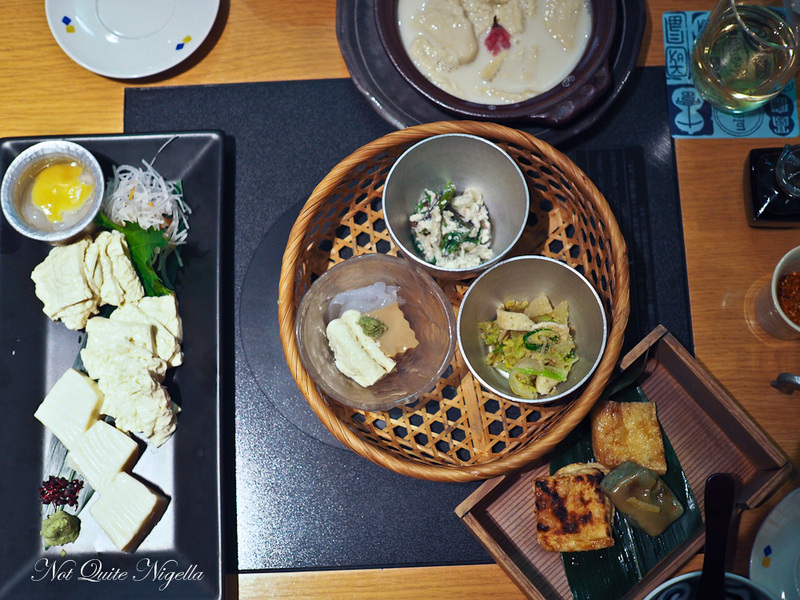 Kaiseki dinners start at Y14,000 per person and go up to Y40,000 per person depending on the restaurants. Nakamura in Kyoto has three Michelin stars and charges around Y23,000. 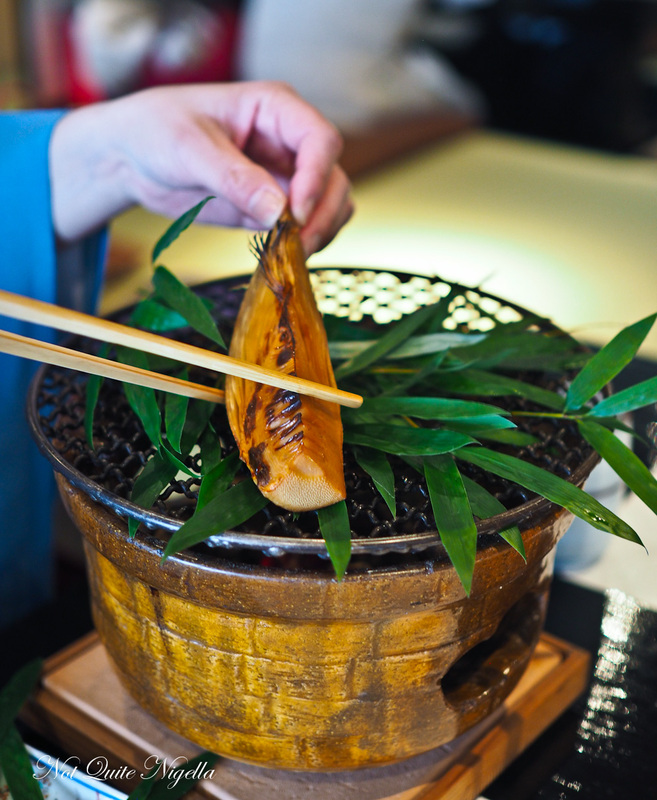 A hallmark of kaiseki is local, seasonal ingredients and in Kyoto it may even mean Kyo ryori or Kyoto cuisine. 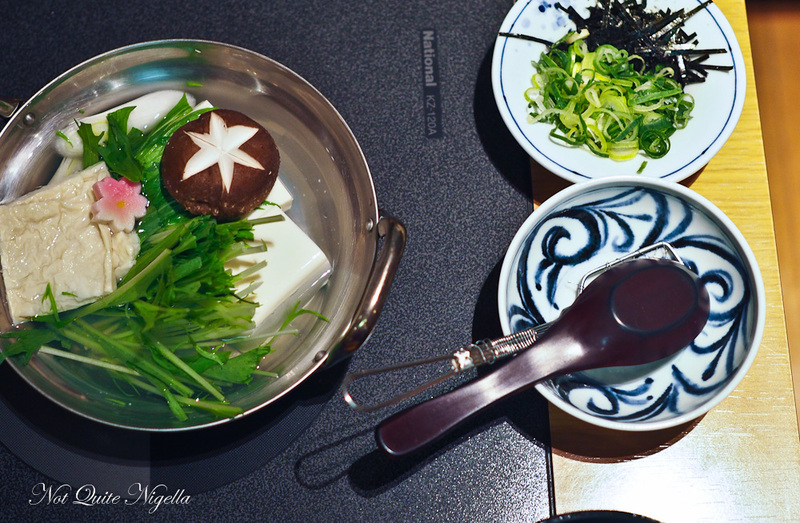 There is usually a range of dishes each reflecting a different cooking technique: soup, grilled, salad, hot pot, rice, amuse, appetiser (hassun). The presentation of these dishes is superb and you may find yourself gasping in delight at the beauty of each course. 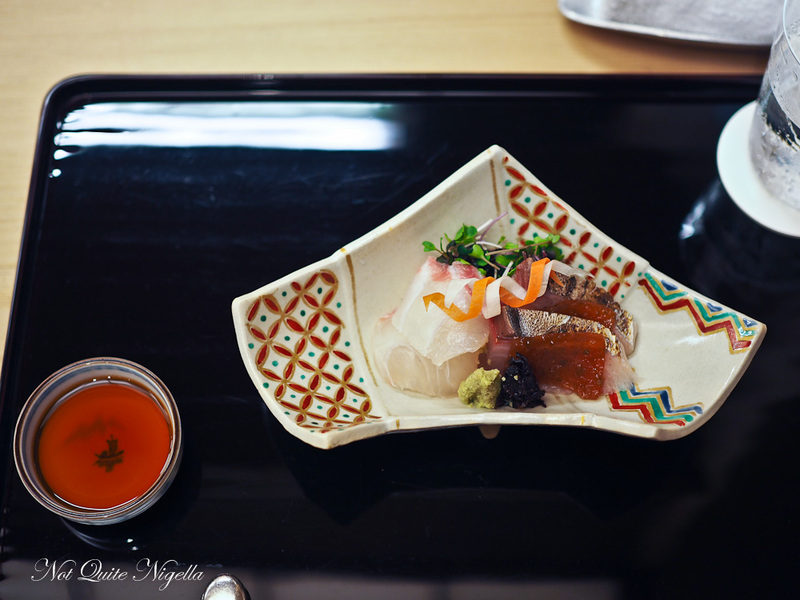 The pace of a kaiseki meal is determined by the customer. If you don't want a long, drawn out meal that goes for hours then you're in luck. Our 12 course kaiseki at Roan Kikunoi took about one and a half hours because they bring out the courses quickly after you finish the previous one. There is a full review to come. 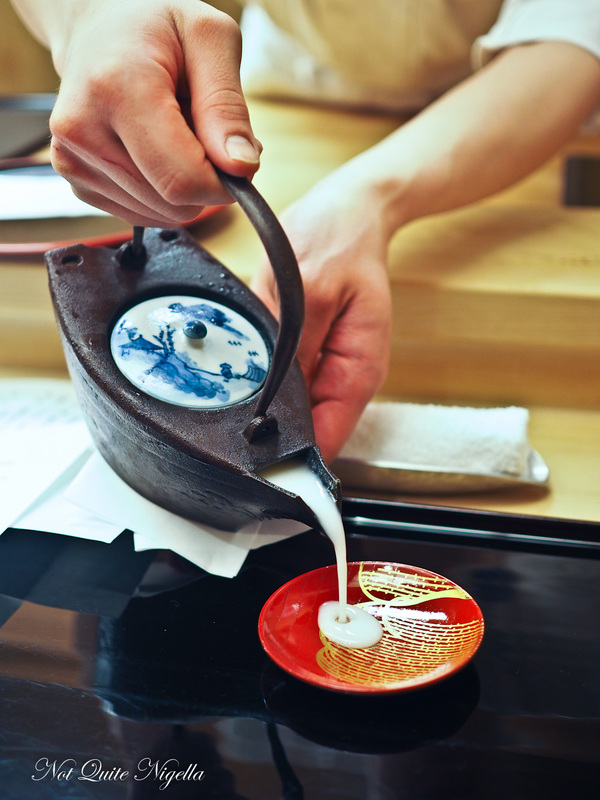 Tip: book a kaiseki restaurant as soon as you have your travel plans as they can be very busy. If it stretches your budget a bit too much, try going at lunch time where they may have a mini kaiseki or a set menu (the latter is not kaiseki but you will get to try the food made in that kitchen). At Roan Kikunoi where we ate, the dinner mini kaiseki is around Y13,000 plus 8% tax and goes up to Y18,000. When Mr NQN arrived in Kyoto a few days before me he already had a bit of a lay of the land. 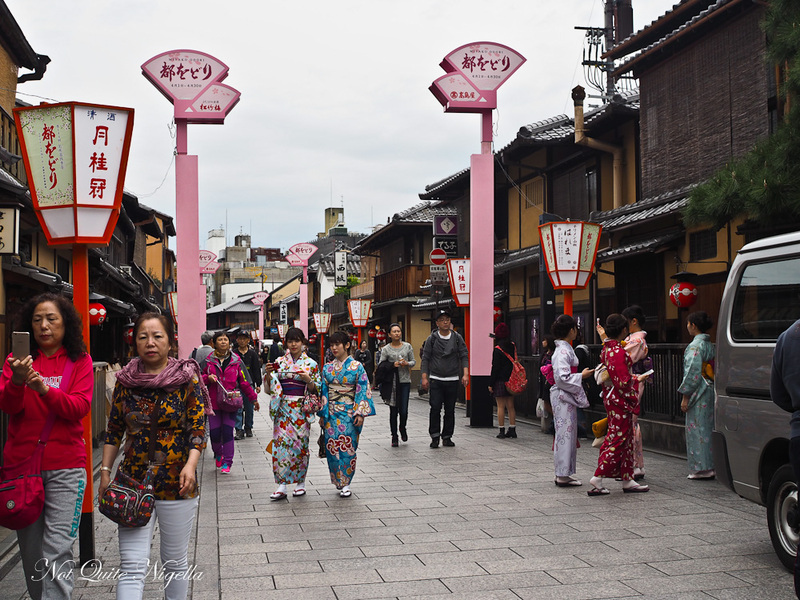 Shijō dori (dori means street) is a busy and touristy and frankly lacking in Kyoto's traditional charm. The best bet for something great to eat is to head off down one of the side streets. This is where he found Hishio Ramen on Yamato Oji dori. At this sleek, gorgeous looking ramen bar you take off your shoes and slide into a spot. But it's not the looks that thrill the most, it's the ramen. 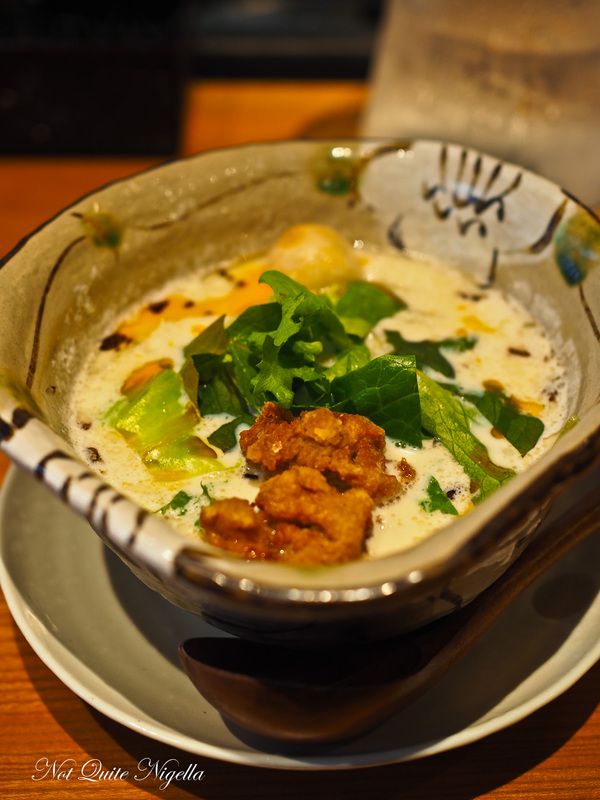 In particular the soy milk ramen that is completely vegetarian (down to the deep fried soybean chunks that resemble chicken karaage or pork). The noodles for this are made from Molokhia or Egyptian spinach. And soy milk in Kyoto is smoother and not as claggy or grainy so all the soy milk does is impart a creaminess without ever clogging the palate. It's perfectly seasoned too so you don't ever feel like you're missing out by eating vegetarian. And a bonus are the beautiful hand made bowls that you eat from. Tip: the other ramen are nice enough but this was the definite favourite. There was another one that was said to be the ultimate ramen and was twice the price, but we both preferred this one. I've got bad news if you are a vegetarian and you hate tofu because they do love it here. But I can promise that it will perhaps be the best soy milk or tofu that you've ever had. And they use it in creative ways too. 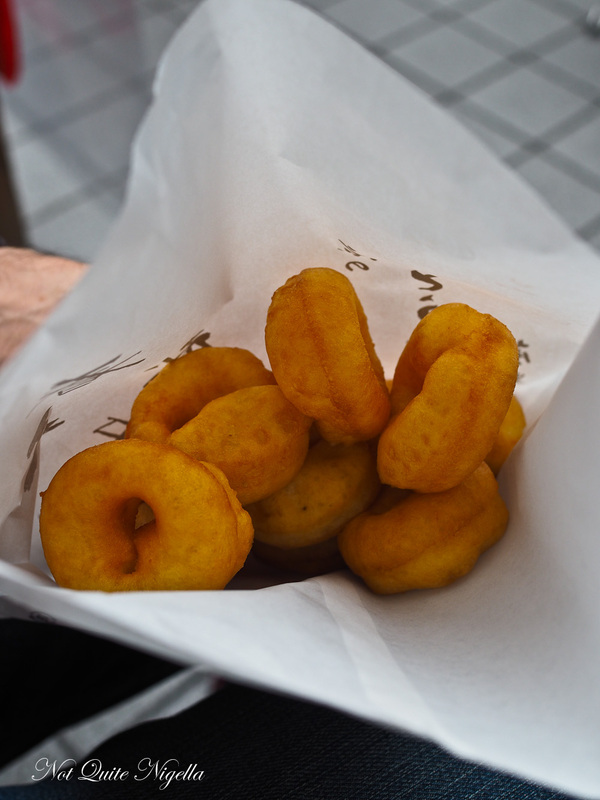 Take for example the soy milk donuts at Nishiki markets. Nishiki Markets are from 9:30-5:30 they're well worth visiting for a look or even to pick up something for lunch or dinner. At Fujino Tofu (the same place where we had the tofu set but we're honestly not stalking them) they make soy milk donuts that they sell in lots of 10 for Y300 or 23. The donuts are small and freshly fried and so light and fluffy-they're similar to Chinese bread sticks but less greasy. Tip: Make sure to buy the donuts freshly made from the right hand side of the shop rather than the ones that are already in the bag. Japan has a love affair with sweets. There are plenty of Western style cakes but it would be a missed opportunity if you didn't try some of the traditional sweets. Many of them involve sticky rice flour mochi or sweetened adzuki beans. London-yaki are sold in the Shinkyogoku Shopping Arcade and at Y50 each or around 50c they're worth a try. Freshly made and hand trimmed they are filled with white bean paste. There's usually a queue of people waiting. Further into Nishiki market, vendors sell sakura mochi. 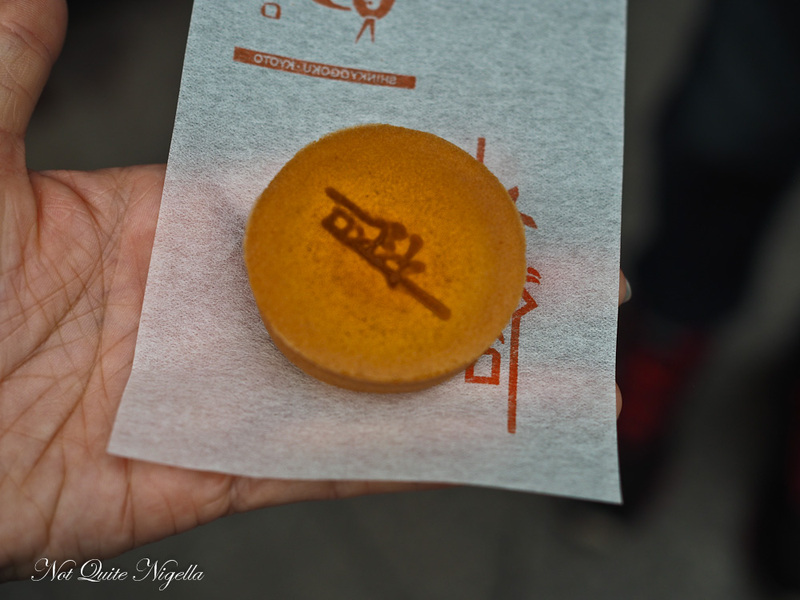 The outside is made up of pink tinted rice flour and it is filled with red bean paste. 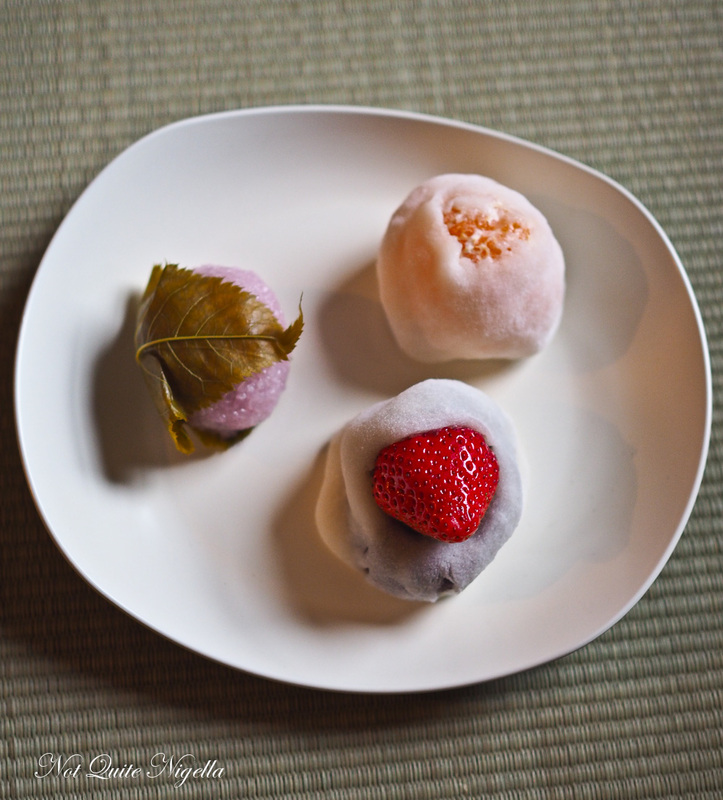 The sakura mochi is then wrapped in a pickled cherry leaf. Mikan (or mandarin) mochi is an entire peeled mandarin surrounded by sticky mochi. The strawberry one is filled with red bean and topped with a single perfect strawberry. Tip: try the ones with fruit and then you'll get to try the exquisite sweetness and perfection of Japanese fruit. Also a Dear Reader Grace who lives in Kyoto recommends buying a knife from Aritsugu knives. You can have your name carved in katakana (the Japanese language for foreign words). Click and drag to see Nishiki market in 360°! Pack small. Especially if you are travelling to Kyoto during cherry blossom season. Or if you can't pack small stay at a hotel near the main train station (that will store your bags). The reason being is that finding coin lockers at Kyoto station to store your bags in is an almost futile task. Finding a coin locker is harder than finding a free park in the Sydney CBD. Mr NQN and I had two large bags and could only find one coin locker and we walked around Kyoto station for one and a half hours trying to find a locker. I was even elbowed out of one by an Obasan (a middle aged woman). It's dog eat dog. If you have small bags, restaurants can help out and can store bags even in the corner near you. Book restaurants ahead of time. 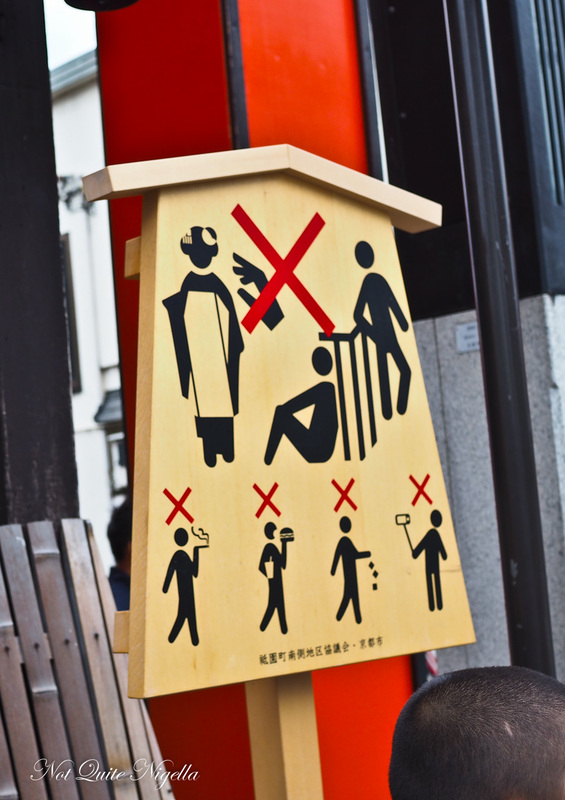 Kyoto is very, very busy and you should aim to book your restaurants as soon as possible. Either that or arrive as soon as they open, often around 11am or 11:30am. With addresses, 1F means the ground floor. 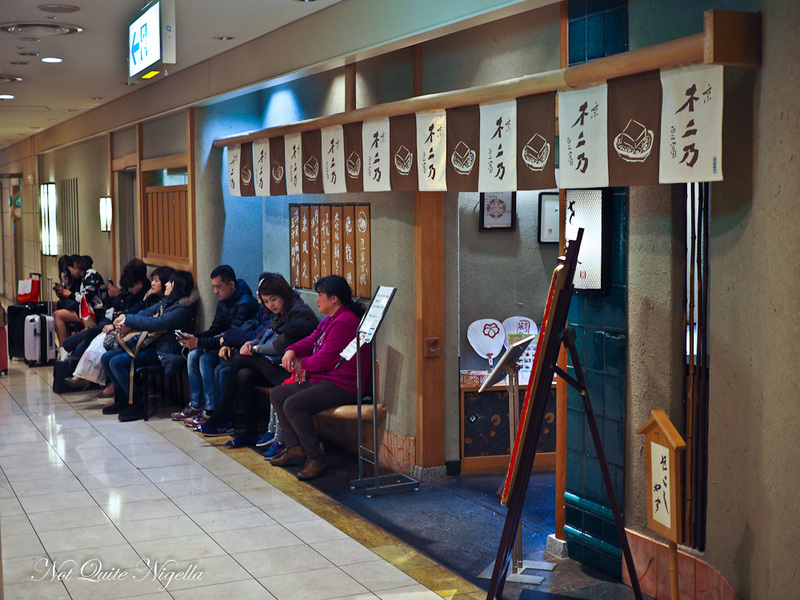 Nishiki Market is fantastic and crowded but a great way to try Kyoto style food and snacks. 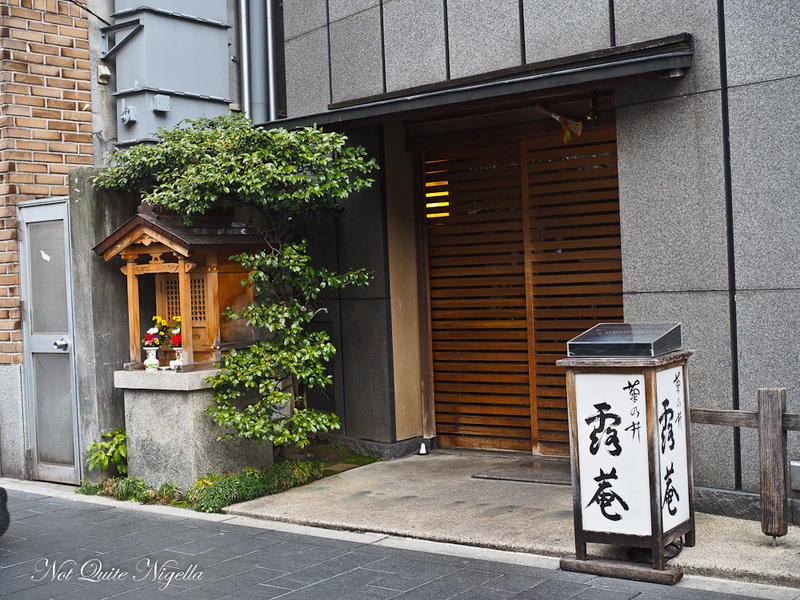 We stayed near Shijo station and this was an excellent spot for a couple of days in Kyoto. It was within easy walking distance to Gion and a lot of restaurants. 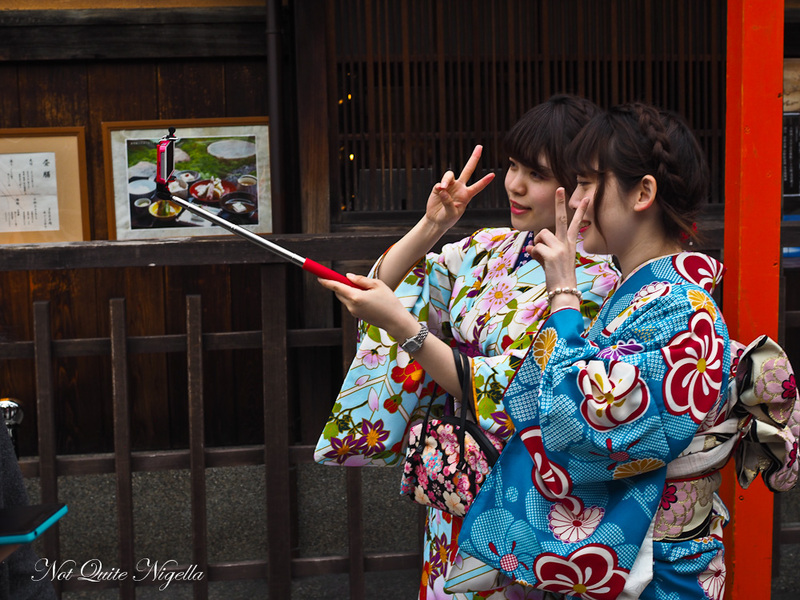 Maiko san (geisha in training) are rarely seen but there are plenty of girls in kimono. 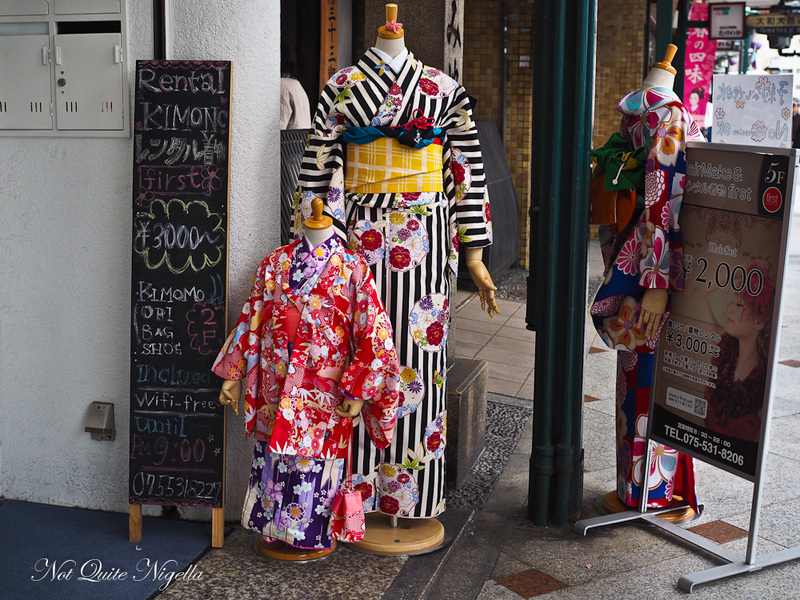 Kimono outfits can be rented for the day from stores along Shijō dori. 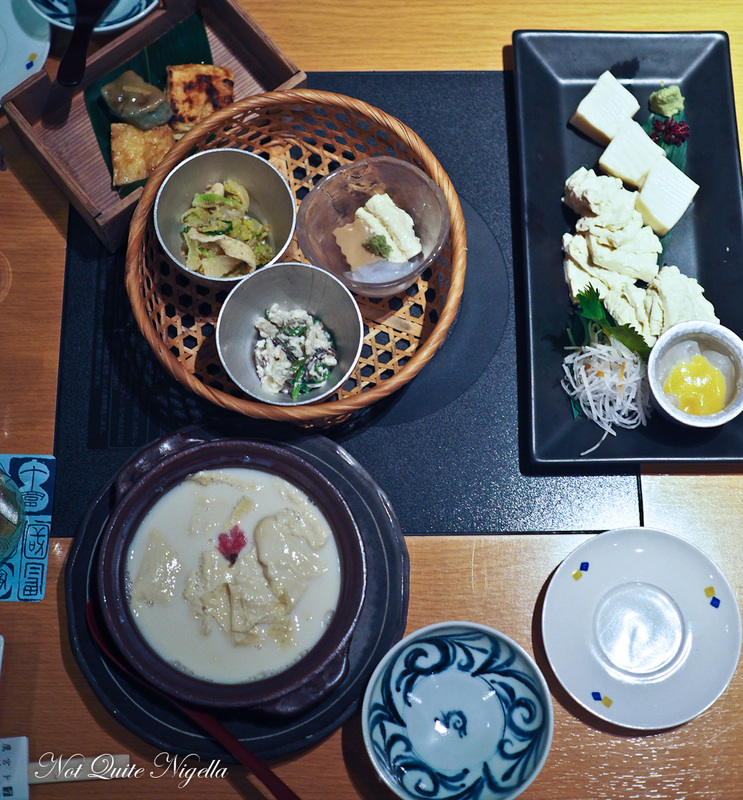 Kyoto is also known for Shojin ryori or Buddhist vegetarian cuisine. We had intended to visit a restaurant on our last day but as we had to check out of our accommodation we had a major issue with storing our bags (see first point above). We had to give up on our quest to try Shojin ryori as a result. While you can collect food souvenirs to your heart's content at every corner there are some you can buy last minute so that you don't have to carry them when you travel. Terminal 2 at Narita Airport has a good range of Japanese Kit Kats and a selection of Royce "Nama" chocolates. These are "fresh chocolates" and have a high cream content and are essentially like a ganache and they melt on the tongue. They're also very well priced at Y720 (about $8.50AUD) for a box whereas a box will set you back $24 at the Sydney store. If you pay Y100 you can get an ice pack to help them stay fresh during the flight. NQN flew to Japan as a guest of the JNTO but all meals and accommodation in Kyoto for her and Mr NQN were paid for independently. travelHiroshima Hai - The Best of Hiroshima Style Eats! 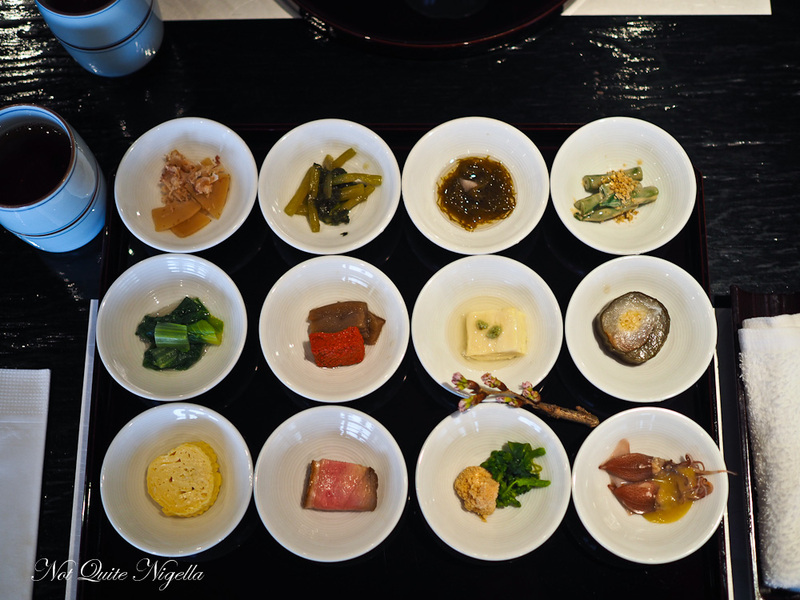 travelDivine and Refined: Kyoto Style Kaiseki! travelCrazy Tokyo: 5 of The Best Theme Restaurants In Tokyo! 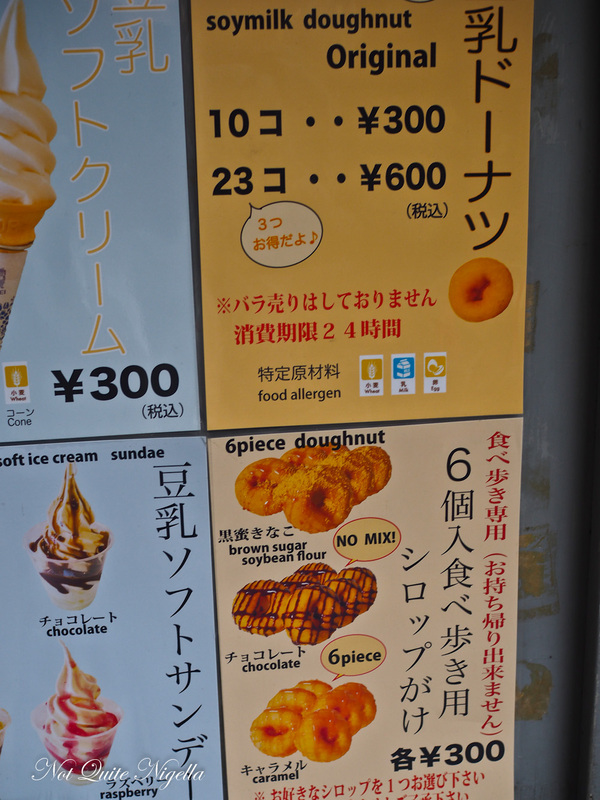 travel5 Foods That The Japanese Have Perfected! travel Hiroshima Hai - The Best of Hiroshima Style Eats! 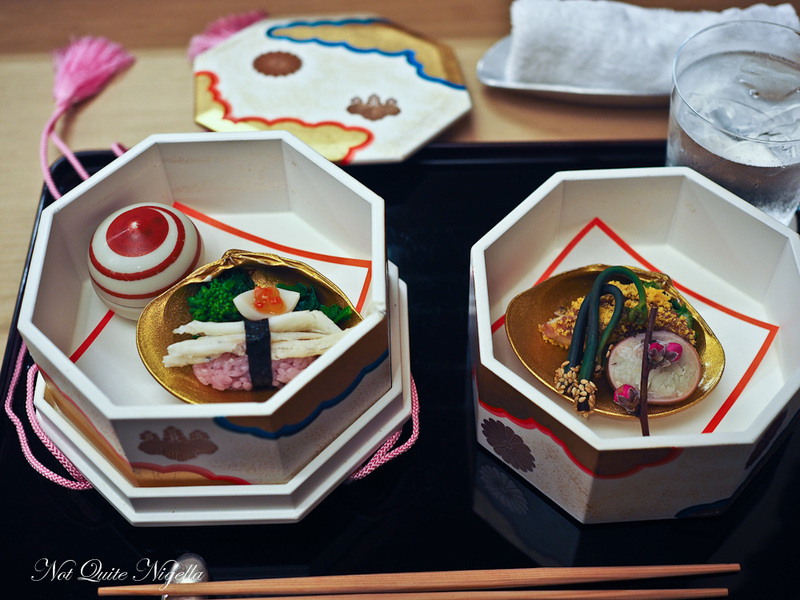 travel Divine and Refined: Kyoto Style Kaiseki! travel Crazy Tokyo: 5 of The Best Theme Restaurants In Tokyo! travel 5 Foods That The Japanese Have Perfected!